SoftCafe is a small, non-corporate software company headquartered in sunny Cabin John Maryland, just minutes outside of our nation's capital, Washington DC. Our customer base is diverse and includes thousands of independent restaurants, bars, eateries, hotels, country clubs, resorts, spas, caterers, food service distributors, and dispensaries. Many hospitality management schools also use our software in their restaurant management courses and curriculum. In 1994 we invented restaurant menu software for DOS. Soon after our Windows version included drag-and-drop, and then in 1997 we added a method to sync printed menus to user websites. All with the purpose of giving small, independently owned restaurants a method to compete against big chains. In 2003 we were awarded two U.S. design patents. With our software, local mom and pop restaurants could make menu updates at virtually no cost and offer unique seasonal dishes that were unavailable at the chains. This not only reduced their operating costs but also helped them attract new customers. As the word got out, our reputation for bug-free software and fast, friendly service quickly created a growing band of loyal customers. 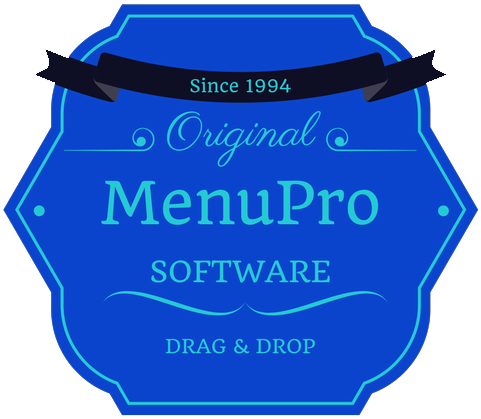 Since then, we've continued to update and refine our menu software and today, thousands of restaurants and hospitality professionals from around the world rely on it. Please send an email to if you have questions about our business or products. Menu software designed in Maryland. All rights reserved. More sample menus and menu templates here. Customer testimonials here.